Track #3 Sunny is the third in the Track series and so far, perhaps the strongest of the bunch. 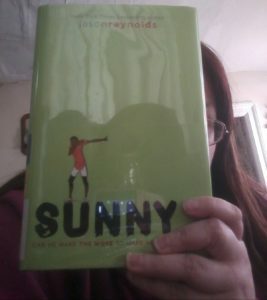 Jason Reynolds has written Sunny in a diary format. While the information is all there (seeing Sunny running, not running, dealing with his family and friends) it is more tell than show. This can be a little awkward at times as, with a real diary, Sunny does not always start at the beginning or make sense. But there is a reason for that. Sunny’s writing is like Sunny: it all over the place. It must move. It must flow. It must dance. While Sunny is stronger in many ways then Ghost and Patina, it also has a few holes in it as well. The situation with the father, while believable, in many ways has his actions borderline abusive. This leads me to wonder why Reynolds chose these elements to be presented, but not really addressed. I would like to see more about the sports presented as running is not usually a sport in books nor is the field part of track and field. Reynolds, while I know it is not the main part of the story, has an opportunity here to educate about a little-known sport. In the end, the story is about making yourself happy, finding joy in what you do for yourself. It also is about connecting with the past, while not losing the future. However, the age this is aimed for (the 10 to 14 crowd) will most likely just see a story about a young kid coming into his own. Like the two before it, Sunny ends on a note of uncertainty (will Sunny win his new sport or will he come in third of third) but also is a good “wrapped up” ending. Share the post "Track the field and you’ll see Sunny shining"